12.03.2011: I have posted a new release, you find it here. 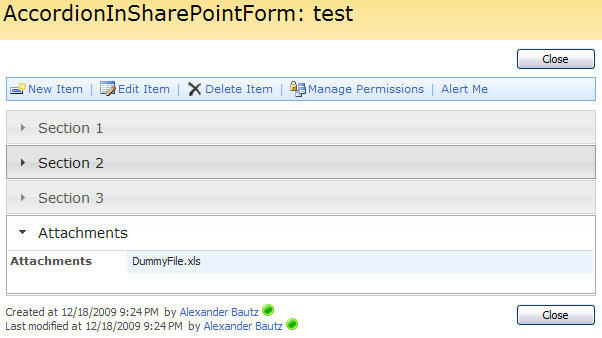 In this example i will show how to use the jQuery UI widget “Accordion” in a SharePoint form. The jQuery UI-library is found here. Find the theme of your choice – mine is “smootness” – and download the files (select the widgets and effects you want – the file is dynamically built according to your selection). Add a CEWP below your NewForm, DispForm and EditForm. The only parameters you need to edit in the script is the array of FieldInternalNames. The format of the variable “arrOfFields” is accID|FieldInternalName. In the html above the script, adapt the number’s of sections – and the section’s display name. The accID corresponds with the index of the table to insert the content in (zero-indexed). All fields must be added to a section – if not it looks ugly…. Note: As for the “Tabs in SharePoint form”, by now i have tested and found that columns of type “Multiple lines of text (Rich text or Enhanced rich text) do not work. What happens is that the section shows some of the fields hidden parts. I have not done any testing on how to prevent this issue, so feel free to notify me if you find a workaround. Note: The animation is disabled because of a “flicker problem” in IE8 due to the page being rendered in “Quirks Mode”. Nice as always Alexander! Thanks alot for all the usefull stuff your doing, and keep on! How would I accomplish this task in a single item form in SPD. I tried and all I got in the CEWP was headings and no accordions. I went in and tried but I am getting nothing. I am using a single item form which just wraps the headings in tags. I went in and switched the to h3 ms.standard headers and opened the form in toolpane view added a CEWP under the form but still nothing. Any help will be greatly appreciated. Should I have a different name other than CustomForm when I initiate? I may have misunderstood how you created your form. Can you explain how you make your “single item form”?. 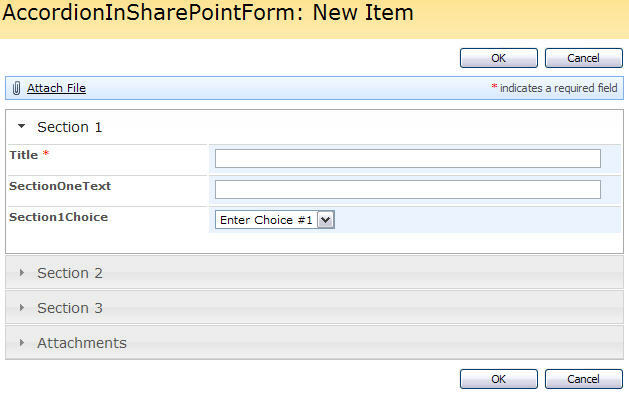 Have you got it working in a standard NewForm or EditForm not modified in SPD? When I use a “New” or “Edit”form and follow your instructions on the site it works great. What I do is insert a dataview webpart in SPD . When I do I choose my list from the data soure libray which open the list. The you choose the items from the list you want and select “insert as a “single item form”. Thanks for all your help I have been trying to get this to work for a long time. What you must do is to make your “label-TD’s” recognizable by the function “init_fields_CustomForm()”. The custom function below looks for all TD’s in the page that has a class of “ms-formlabel”, and who have a “h3” with class “ms-standardheader” containing the label. To adapt the script to your custom form, you must add a class as described above and edit the line “$(“td.ms-formlabel h3.ms-standardheader”).each…” in the script below to match your TD’s class. Has it been fixed to work with multiline text boxes? It does work with multi line text, but only the “plain text” type. The rich text and enhanced rich text is still a problem. wow ok, what about date field? for some reason date filed shows up but barely readable….. Does the tab control have the same problem with multiline? Because multiline plain text is rather lame…. Is what you are requesting like this: Arrange webparts in tabs in webpart page, but with an accordion? Hi, a quick quest (hope so) if I don’t want the last section (attachements), it´s seems that is not enough to out comment the $(“#idAttachmentsRow”).appendTo(‘#accTable-3’); – so is this doable in some other way? You have to remove line 8 and 9. Can you provide more detail for the specific folders/files that need to be downloaded from the jquery and jqueryui sites and also more detail regarding the sharepoint library setup; you mentioned creating a folder in the library named jQueryUI. The download from jqueryui site results in 3 folders (CSS, development-bundle, js) and an index.html file. Is it necessary to upload the entire jqueryui download to the sharepoint library (for example, is it necessary to upload the development-bundle folder)? The image you have above shows just 2 files (jquery-ui-1.7.2.custom and jquery-ui-1.7.2.custom.min) and an images folder (but there is a lot more in the jqueryui download). Lastly, under the terms of the license, can a business use material downloaded from jquery and jqueryui in there corporate sharepoint environment? Thanks very much for your help. From jquery.com you download the latest version. From jqueryui.com you download the latest build 1.8. This download also contains the latest bulid of jquery (1.4.2). As you noticed, only the files “jquery-ui-1.8.custom.min.js” from the “js” folder, and the “jquery-ui-1.8.custom.css” and the “images” folder from the “css” folder is needed. Are the jQuery UI-library files (jquery-ui-1.7.2.custom and jquery-ui-1.7.2.custom.min) needed for Accordion to work? Why does the code that goes into the CEWP only reference the jquery-ui-1.7.2.custom.min file and not the jquery-ui-1.7.2.custom file? The “accordion” is created using a widget from jQueryUI. The CEWP code refers both the css file and the js file (line 12 and 14 in the above code”. Is it necessary to keep the code you’ve provided in a CEWP? Would it make a difference if I launched Designer and added your code directly to the NewForm.aspx page immediately following the DataFormWebPart for the List? Would your code still work or is this just not possible and if it is possible would your code work as is or would it require modifications. I know the trick to add a CEWP to a form like NewForm.aspx (in the URL replace everything following the ? with ToolPaneView=2) but one of my clients has a situation where the NewForm.aspx simply cannot accommodate a CEWP which is why I’m interested in knowing this. Many thanks. That would be no problem as long as you put the code below the form, in the aspx page. As you said, it doesn’t matter if you use the CEWP or not. But weather I use the CEWP or put the code directly into the page using Designer, the results are the same. The Accordion doesn’t error but it doesn’t work either. What happens is that when the page is displayed in the browser, the form itself (fields and all) look fine, as they normally do (but no Accordion). However, the 4 section labels, that is, the words themselves: Section 1, Section 2, Section 3, and Attachments are displayed below the form. I know I’m doing it correctly because testing at home, it works, but testing at the office, it doesn’t. I was wondering if you had any ideas about why the behaviour I’m describing might occur Thanks. Check the script reference to jQuery and jQuery UI. Hi there – this works fab apart from with fields that have a space in them, or a slash. For example, one field is called “Start Time”, and i put ‘0|Start Time’ in the arrOfFields but it doesn’t work, that field stays at the top of the form along with all the other fields with spaces in the name. Also, i have a field called “Hotel/Venue”… how would I do the “/” in the arrOfFields declaration? All the scripts use the FieldInternalName to identify fields/columns. How would i change the display name of a field using the accordion. Is it possible to have a formated form with the accordion. Q2 you must specify some more for me to understand what you want to do. 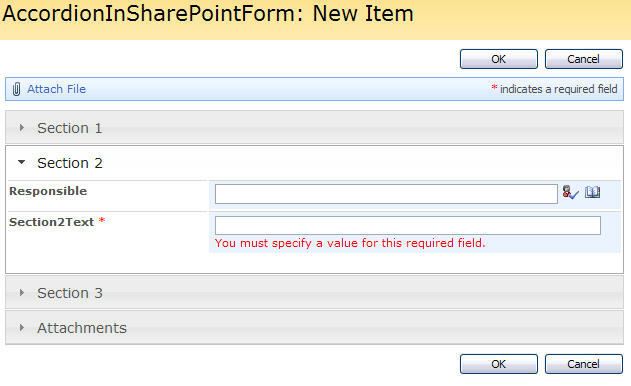 Take a look at this one SharePoint form: present fields side-by-side and try to combine them. You may need to call the accordion function first. Here is the init_fields function in the accordion code. If I insert the code to rename a field, the field is not renamed and the accordion isn’t functioning anymore. in line 25 in the code above, it renames the Title field “My new title”. Thanks for the good post. I have one doubt. If My column name is having white spaces then I’m unable to show that column in the Accordion. Could u please tell me how to access Column Names which is having white spaces in it. I got the answer for this question. But I’m having another problem that, if a perticular column is having more than one space charecter it is not accepting (i.e., Continuously learn and adapt). The word contains 3 spaces. could u plz solve my problem…. You must use the FieldinternalName for all the fields. I got it from ur valuble suggestion. But one more thing, Accordion is possible for Custom List Forms? Hi Alexander…script works great however my date field (next to the date picker) has been reduced in size to illegible. Thoughts for a fix? Is there a way to show or hide fields. Is the problem with the rich edit text fixed? Sorry, but no. I have not had any time to work on it. I’m having a problem with this script. I have changed the path of Jquery-UI-Custom (JS) and the CSS files to an “internal” list. Any ideas? I would really appreciate some help. Hi, It is impossible for me to say what’s wrong. Did you get it working before modifying the code? I could make it work after some coding … I don’t know what was wrong but I was able to make it work. Thanks for your answer anyway. Now I’d like to ask you something else, if you don’t mind! I’m working with content types, and some of this “sections” do not apply to all of them. The only thing that came up to my mind was to “IF” the sections’ code depending on the content type or some parameter in the URL. Does this still work with latest and greatest jquery and jquery ui librarys? Hi Alexander quick question will this code still work with the latest jquery librarys? I’m sorry, but I do not know, you would have to test it. Hi Alex, i have a little problem here with a application that i included this solution. I have a drop down with more than 20 elements, when the user select this control, the render of the control is not in the correct place. The render is far, far away of the original control. Do you have this problem? How can i resolve that? In your script, we are working with the fieldinternal name. Is it possible to use the fieldinternal name but rename the column in the form without creating a custom newform? Yes, the FieldInternalName is not affected by the DisplayName so you can change it as you like.